Let us follow the series of processes through which the image signal of a galaxy arrives to us, is collected by the telescope, is registered by our CCD [what is it?] detector, and is finally read as a file to be eventually processed. The clear understanding of this pipeline of happenings allows us to carry on a proper data reduction and a correct error analysis. Let be the surface intensity distribution map of the galaxy as a function of coordinated in the plane of the sky. We put the origin at the galaxy center [What does this mean? Geometrical center or brightness peak?]. Let be instead the surface intensity distribution map of the sky brightness: the light from the unresolved cosmic background, the atmospheric airglow, and the human pollution. In the ideal case is a constant, but this never happens. For simplicity we neglect here the contributions to by sources other than our target galaxy, such as Milky Way objects and resolved extragalactic objects, which though exist and must be accounted for. We also ignore defects, cosmic rays, and noise. is then blurred while passing through the Earth atmosphere (which takes place just a few tens of meters above the telescope and is named “atmospheric seeing”) and through the instrument (which has vibrations and optical elements with a finite resolution). where indicates a convolution product and is the “point-spread function” of the overall “seeing” and represents the convolution of point-like source. Oversimplifying, the is classically characterized by one 2-D symmetric Gaussian function with variance (< 1 arcsec in fair/good ground-based astronomical sites [does the Hubble Space Telescope have a finite PSF?]). A way to quantify the generic PSF is to give the full-width at half-maximum, FWHM, which is the width of the function, whatever its shape is, at half the distance from the peak [show that, for a Gaussian PSF, ]. You noted that above the convolution by the PSF was not applied to the night sky signal S. The reason is that, having decided to ignore fore-background sources, the characteristic frequencies of S are orders of magnitude lower that those of the point-spread function: in conclusion, S is not altered by the convolution. from where we need to extract ; not , since what is lost by the pixel averaging ( , ) cannot be recovered but marginally. In order to reach our goal, first of all we have to set up a proper observational strategy to recover all the information that we will later need. If the detector field is small than our target galaxy, there is no direct way to estimate the background directly on the science exposure. There are ways to overcome the problem [can you guess one?]. Note that the background must be accurately defined to avoid increasingly large errors in the galaxy outskirts. The risk is a stretched galaxy for a too faint estimate of S, a truncated object for a too bright estimate. [Try to evaluate this effect on a toy model]. The PSF is usually mapped using the non-saturated images of bright galaxies present in the science exposure. 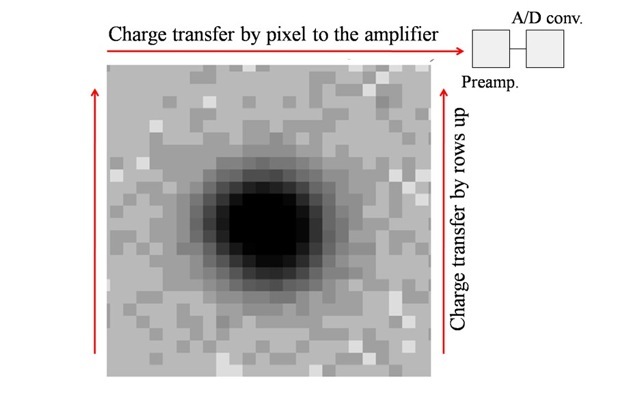 The way this PSF is used for deconvolution, if the case, will be briefly discussed later. At the beginning of the observing night, and at the end, several exposures of a uniform artificial source (or of the sky at sunset/dawn) are secured to obtain the flat-field map F, and other exposures for bias and dark current. In this brief account we neglected further complications such as non-linearity (as in photographic emulsions); tiling of CDD mosaics, which requires multiple exposures slightly shifted one from the other (dithered exposures) to remove the inter-tile gaps and causes grave unevenness in the background; fringes (same as Newton rings), due to reflecting surfaces in the detector (particularly in the IR); contamination by neighboring celestial sources; cosmic rays and defects removal; photometric calibration, which requires the observation of standard stars, and the extinction correction. at increasing distances from the center, where the decreasing surface brightness competes with the night sky: typically ). is a sinusoid of amplitude , frequency , and phase at . Prove that is the antitransform of its transform: . 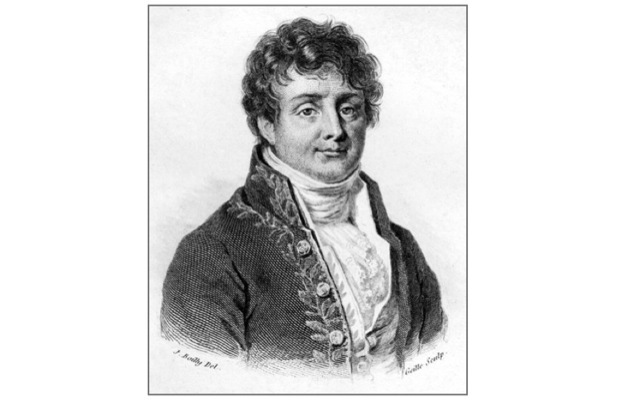 Jean Baptiste Joseph Fourier (1768-1830). i.e. the power is the same in the space of the function and in that of its transform. which is a Gaussian with variance equal to . Also, the convolution of two Gaussian functions with variances and and and centers at and is again a Gaussian with center at and variance: . 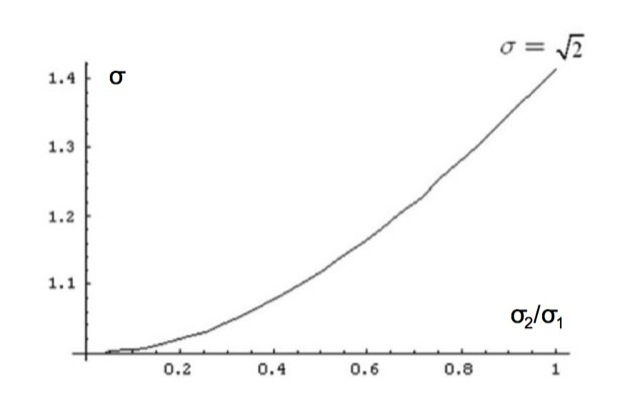 Variance of the Gaussian resulting from the convolution of two Gaussians. Let us first ask ourselves why the mathematical equivalent of seeing is a (two-dimensional) convolution. 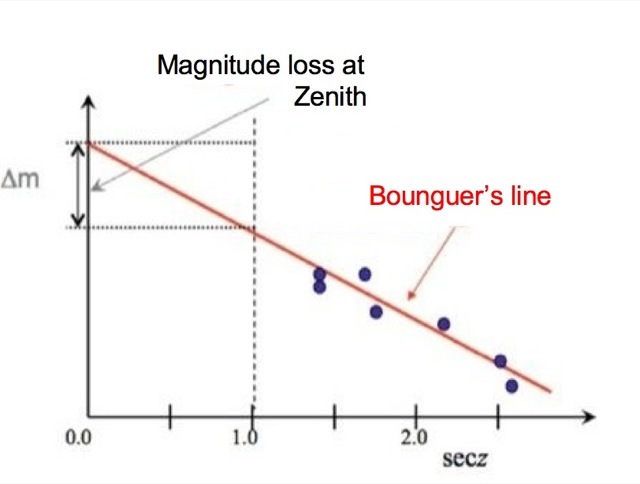 The answer is that an exposure is the sum (time integration) of a same image slightly shifted in two (independent) directions by the atmosphere and by the telescope according to a sort of weighting function, the , which tells us for how long (relative to the total exposure time) the image has been in one relative position. Remember that the is the blurred image of a point source, and that the timing of the process is given by the frequency of seeing blurring, . The light profile is the cross-section of the surface intensity map through the center of the object. It is unique for circularly symmetric galaxies. For nearby large galaxies and a reasonable seeing, it is . This implies that the galaxy envelope will be unaffected by atmospheric blurring. [No longer true, if the galaxy distance increases. Why?] The figure shows the effects of convolution on a spherical r1/4galaxy: the center is depressed and the energy redistributed all around it. The core instead can be narrow enough, , and even narrower that the seeing (then we say that it is unresolved). In this case the convolution will be effective: the result will be a less peaked profile. Since the process is conservative, though, the energy lost by the peak will be redistribute at larger radii. In summary, a seeing convolved profile will be fainter that the unconvolved one near the center, than brighter and farther out unmodified. From Capaccioli and de Vaucouleurs, Ap.J.S., 52, 465, 1983. Can we recover what seeing has washed out? In order to answer this question we need to recall a basic theorem of the information theory: the Nyquist-Shannon sampling theorem. The sampling theorem states that can be perfectly reconstructed from a discrete sampling at a rate of samples per unit of . The smallest sampling frequency, named after the American mathematician Harry Nyquist, is then: , and the Nyquist sampling interval . where is the surface density of the signal, that of the noise, and the detector noise, independent on the pixel size. where and are transforms of observables, is , i.e. precisely what we need. Unfortunately, this simple procedure [but is it really simple to perform a FT on an image?] hits the wall of noise. In fact, it can be shown that it amplifies dramatically the noise [explain heuristically]. Thus, any deconvolution procedure must be accompanied by a proper noise control. This latter is just a full chapter of the information theory! 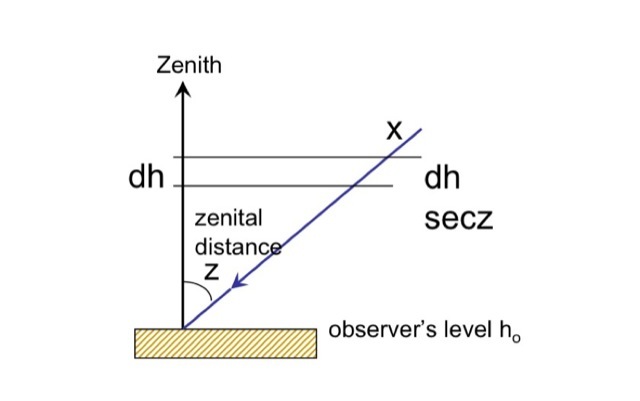 Plane parallel approximation for the atmosphere about the Zenith. Derivation of mÎ» by extrapolating the observations of the same star at different angular distances on the same night. Outer space, in between Milky Way (MW) stars and among galaxies, is not empty. It is just a very low density environment, far more empty than the best vacuums in terrestrial labs (1 atom/cm3, and a mean free path of ). Literarily, the interstellar medium (ISM) is the gas (99% of the total mass) and dust (1%) filling the interstellar space among stars in galaxies, and bleeding in/from the intergalactic space. It is a turbulent ensemble of ions, atoms, molecules, larger dust grains, cosmic rays, and (galactic) magnetic fields, which emits, absorbs, and reflects radiation. As a consequence of the primordial nucleosynthesis, by number of nuclei (not mass! ), of the gas is H, He, and heavier elements (“metals” in astronomical jargon). Dust is made visible by the obscuration of foreground sources (as the Coal Sack) or revealed by the emission of associated molecules. Unawareness of the effects of the Galactic dust on the photometry of stars has led to major mistakes in the 20-th century. Extinction has two effects: it reduces the intensity and reddens the radiation, as scattering [Rayleigh but not Thomson? Which one?] is more efficient in the blue than in the red. Gas may either re-shine energy of nearby sources (e.g. 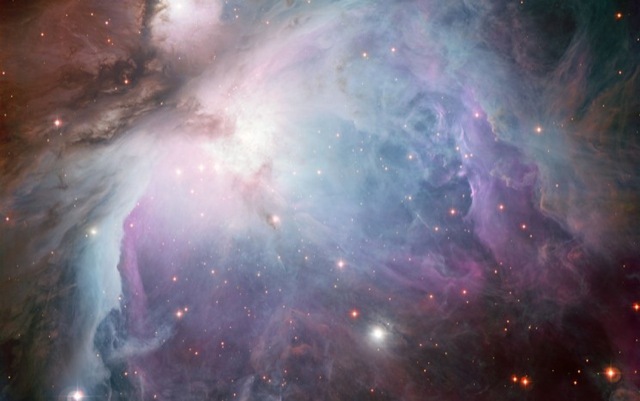 Orion Nebula), emit its own photons in form of emission line spectra (e.g. HI extensions of spiral galaxies or the Orion Nebula) and non-thermal continua (e.g. emission from extragalactic radio sources), or capture photons causing absorption lines in other sources’ continuum spectra (see, e.g., the Lyman-alpha forests in the spectra of distant quasars). Some intracluster stars have also been identified in the space within clusters of galaxies: all over they are possibly up to 10% in light of the baryons. If the emission is thermal, the colder the gas cloud is, the longer are the wavelengths of its emission (Wien’s law). So, cold nebulae (atoms and molecules) shine in the microwave and radio domain, hot regions of interstellar gas (ions) emit in the optical, and very hot fluid envelops of clusters (plasmas) in the X-ray region. Carina Nebula with priming dark molecular clouds. Credit: NASA, ESA, Hubble Heritage team. where is the Galactic latitude [what is it?]. More accurate extinction maps, which account for the patchy distribution of the dust in the Galaxy, have been produced by Burstein and Heiles (Ap.J., 225, 40, 1978) on the assumption of the proportionality between neutral hydrogen and dust column density. HI column densities are provided by the sky mapping at 21 cm. Neutral Hydrogen (HI): most abundant in interstellar medium ( high lifetime ( forbidden line). In the MW it is concentrated in the spiral arms. Interstellar Molecules: made mostly of H, He, C, N, O, these fragile ensembles, producing spectral bands by rotation and vibration, are only found in the dark centers of dense gas and dust nebulae, usually sites of protostar/star cluster formation. Interstellar Dust: produced in the envelopes about red supergiants, and ejected into ISM by stellar winds and the planetary nebula (PN) phase, dust particles are mostly a few μm C and Si grains. They completely absorb any photon striking them and are collisionally heated by surrounding gas (processes which may destroy the grains), but re-radiate the energy in the far-infrared (FIR). Dust grains serve as sites for the formation of molecules and organic compounds. Dark Nebulae: named “holes in the heaven” by William Herschel, they were then identified as obscuring clouds by American astronomer E.E. Barnard. Dense and cold cores of , spanning and containing molecular H (H2), CO. He, and silicate dust, named Bok globules, are sites of star formation. Molecular Clouds: dense concentrations (up to 109 atoms/cm3) of low temperature ( ) gas and dust, up to wide and containing up to (the largest are said Large Molecular Clouds), favor the formation of molecules at the surface of dust grains. The condition may favor the collapse, leading to protostars [see the Jean mass concept]. 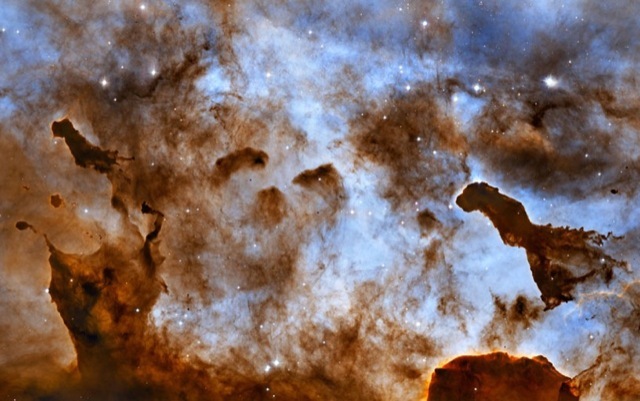 Reflection Nebulae: simple scattering of radiation of nearby luminous massive stars. The nebula is bluer on average than the illuminating star, as the scattering is Rayleigh’s: particles smaller than wavelength of incident radiation and cross section going as: , where is the scattering angle. Masers: often star formation is associated with powerful sources of microwave radiation, called OH or H2 masers. The radiation from newborn stars pumps molecules into excited meta-stable energy states, which transition downward when stimulated by a passing photon (as in lasers). This generates amplification, directionality and coherence. HII regions: large regions of hydrogen photo-ionized by young bright stars, surrounded by neutral H. The UV flux determines the size of the HII region [Strömgren sphere]. HII regions are associated to new stars, then to molecular clouds, and to type II supernovae. Found in spiral arms. Planetary Nebulae (PNe): the ejected envelopes of AGB stars, hotter and more compact than HII regions. The green color is from emission lines of oxygen. Supernova Remnants (SNRs): what is left over by a SN explosion are expanding shells of gas moving away from dead star at supersonic velocities (1% c). They compress the ISM (shock waves), heat it (up to 107 K) and make it glow (X-rays). Structure and asymmetries in SNRs are due to the lumpy density distribution of ISM: expansion runs faster where the density is lower. SNRs slow down with time and merge with ISM, returned material enriched in metals. A supernova remnant is a major source of energy for ISM. Cosmic Rays: protons (90%) , α-particles (about 10%), and rare heavier nuclei, accelerated to relativistic velocities (from 100 MeV up to 1020 eV), producing showers of particles when hitting Earth’s atmosphere. Being electrically charged (positive but very few α-particles), they are deviated by Galactic and terrestrial magnetic fields, so it is hard to trace back their trajectories. They originate from Galactic sources (SN explosions) as well as extragalactic. L.S. Sparke, J.S. Gallagher, Galaxies in the Universe, Cambridge University Press, 2000. Kormendy, J. et al., Ap.J.S.S., 182, 216, 2009. S. Webb, Measuring the Universe - The Cosmological Distance Ladder, Springer, 1999. Mathews, W.G., Brighenti, F., Ann.Rev.Astron.Astrophys, 41, 191, 2003. 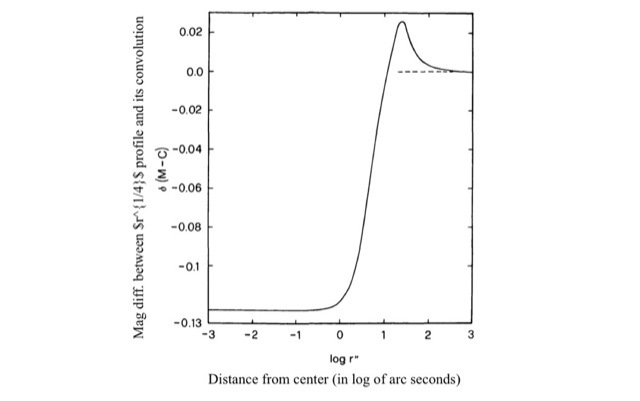 Active galactic nuclei: Ho, L.C., Ann.Rev.Astron.Astrophys., 46, 475, 2008. Kauffmann, G., et al., MNRAS, 46, 1055, 2003 ; Best, P.N., et al., MNRAS, 368, L67, 2006; Khalatyan, A. et al., MNRAS, 387, 13, 2008. Kormendy, J., in Coevolution of Black Holes and Galaxies, Ed. L.C. Ho, Cambridge, UK, Cambridge Univ. Press, 2004. Roberts, M.S., Haynes, M.P, Physical Parameters along the Hubble, Ann.Rev.Astron.Astrophys, , 32, 115, 1994. P. Moore, Eyes on the Universe: The Story of the Telescope, Springer. D. Leverington, A History of Astronomy from 1890 to the Present, Springer. A. Koestler, The Sleepwalkers: A History of Man's Changing Vision of the Universe, Penguin. M. Hoskin (ed. ), The Cambridge Concise History of Astronomy, Cambridge Univ. Press. J. North, Cosmos: an illustrated history of astronomy and cosmology, Univ. of Chicago Press, 2008. H. Spinrad, Galaxy Formation and Evolution, Springer, 2005. H. Mo, F. van den Bosch, S. White, Galaxy Formation and Evolution, Cambridge University Press, 2010. Elmegreen, D. M., and Elmegreen, B. G., Classification based on spiral arm appearance, Ap.J., 314, 3, 1987. Sandage, A., Bedke, J., The Carnegie Atlas of Galaxies, Carnegie Institution of Washington Public. 638, 1994. Nakamura, O., et al., Visual Hubble classification of 1500 SDSS galaxies, A.J., 125, 1682, 2003. Ball, N., et al, Classification of SDSS galaxies using neural nets, MNRAS, 348, 1038, 2004. J.Binney, S.Tremaine: Galactic Dynamics, Princeton Univ. Press. James Binney and Michael Merrifield, Galactic Astronomy, Princeton Univ. Press, 1998.